Talk to any experienced caregiver of a dementia or an Alzheimer’s patient and they’ll tell you; playing a piece of music can have an extraordinary effect, particularly if there’s a personal attachment to the recording. It can bring to the surface a deeply buried memory long considered forgotten. It happens all the time, and when it does, the moment can be quite astonishing. 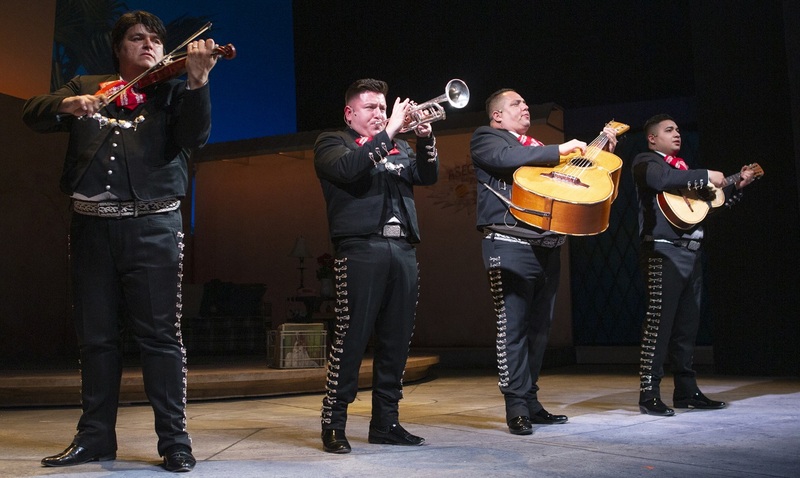 In Arizona Theatre Company’s new Christopher Acebo directed production American Mariachi, now playing at Herberger Theater Center until April 21, that’s exactly what happens when Lucha Morales (Christen Celaya) and her boisterous best friend ‘Boli’ Pérez (Satya Jnani Chavez) play an old 45 on the turntable. It’s the early 70’s somewhere in the southwest. Lucha’s mother, Amalia (Diana Burbano) suffers from dementia. For some time, the woman has remained unresponsive to questions or conversations, only occasionally breaking her silence to ask, “Where’s Carmen?” a reference to a woman who we learn had passed away some time ago. Yet, after going through several old albums and pulling out The Beatles, The Supremes, and even some Simon and Garfunkel to brighten up the afternoon, Lucha and Boli decide on an old single with a label that reads simply AM. Curious as to what it might be, they play the 45 on the family record player. It turns out to be a recording of a Mariachi band. But then something curious happens. The mother stirs at the sound of the strumming guitars and trumpets. She recognizes the song. She knows the lyrics. She starts to sing. Both Lucha and Boli are thrilled. Something somehow has connected with mama. But unfortunately, the moment is short lived. Lucha’s father, Federico (Danny Bolero) enters, hears the recording and immediately switches the record player off. Clearly, there’s a problem. Ignoring the positive effect that the single has just had on his wife, the father plays tug of war with his daughter, resulting in the 45 breaking in two. The secret of the single and why the label reads AM will be revealed later. In the meantime, Lucha and Boli hit upon an idea. Why not recreate a new recording of that piece of music for her mother? Lucha’s dad, a musician in his own right, needn’t know. He wouldn’t approve, anyhow. Mariachi is for men. It’s long been a tradition handed down from father to son. There’s no room in Mariachi for women. Everyone knows that. “He’s so old school Mexican,” complains Boli. All the two girls need is a Mariachi band, an all-female Mariachi who can sing and play their own instruments. But they need to be found. Lucha and Boli start their search. What’s effective in American Mariachi is how Lucha and Boli’s band of misfit women sound. None of the five ladies can play when they first sign up – “I got a kazoo,” says hairstylist Soyla (Marlene Montes) – but after some friendly instruction from old family friend Mino (Sol Castillo), the motley crew eventually band together. 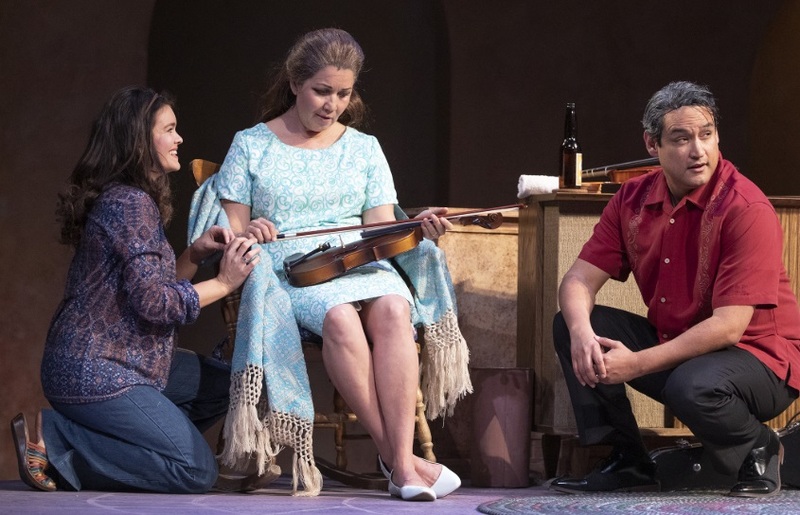 The play is not necessarily going for realism, but it is impressive how the ladies play as if they’ve only just learned their instruments rather than sounding suddenly perfect. 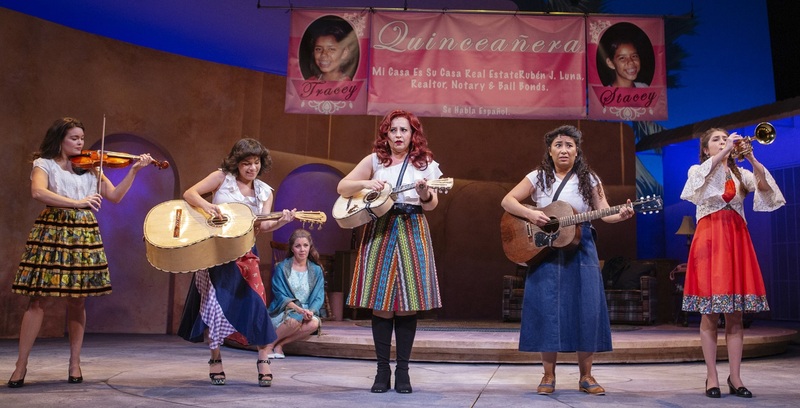 Particularly amusing is how Osiris Cuen’s Gabby looks as though she might topple over at any moment once she’s assigned the large, deep-bodied acoustic bass guitarrón to hold. However, what’s not quite so effective is the uneven style of comedy. There are laughs, several good ones, as when Cuen’s Gabby asks, “Do we have to wear those funny costumes?” Plus, the reaction of Lucha and Boli when hearing reserved choir singer Isabel (Alicia Coca) suddenly burst into an unrestrained ‘embellishment’ of musical notes by way of Mariah Carey is priceless. The lady can sing even if, curiously, she never gets to use that style of oversinging, known as ‘melisma,’ again. But things have a tendency to go broad, cartoonishly so, as when Sol Castillo’s Padre Flores appears, or Eduardo Enrikez’s flamboyant René enters. 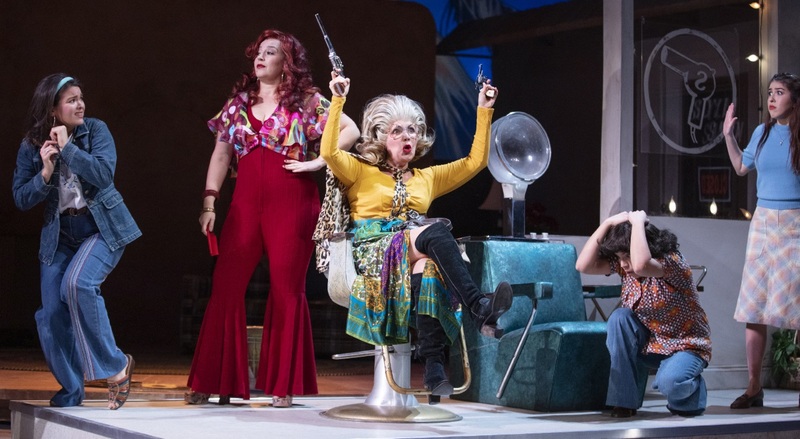 The same with Diana Burbano’s Doña Lola when she pulls out her guns and waves them about in Soyla’s hairdressing salon. All of these moments appear as if the characters were culled from slapstick, over-the-top sketch comedy on Sabado Gigante. Audiences laugh but the style doesn’t play well, particularly when compared to the serious, humorless nature of Lucha’s father, a stubborn fool of a man whose inability to either listen or step out of himself and see anything from another perspective is at the root of all problems. 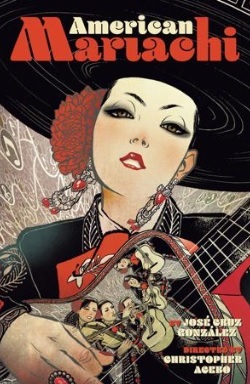 Written by José Cruz González, American Mariachi incorporates themes of family, tradition, respect for elders, and the clash of an old culture for the new, but at its heart lies the old-fashioned Hollywood entertainment formula of let’s-put-on-a-show, with outcomes most will know long before they occur. Exactly as expected, secrets will be revealed, conflicts between generations will be resolved, even the father will come to terms with change (though in reality, given the circumstances of his deeply rooted stubbornness and prejudices, through personal experience, I strongly doubt that would ever happen) and, against all odds and prejudices, the eventual acceptance of women playing Mariachi will occur. It did in real life. For the record, in 2009, the Mariachi Divas de Cindy Shea was the first all-female Mariachi to be nominated and to win a Grammy Award. 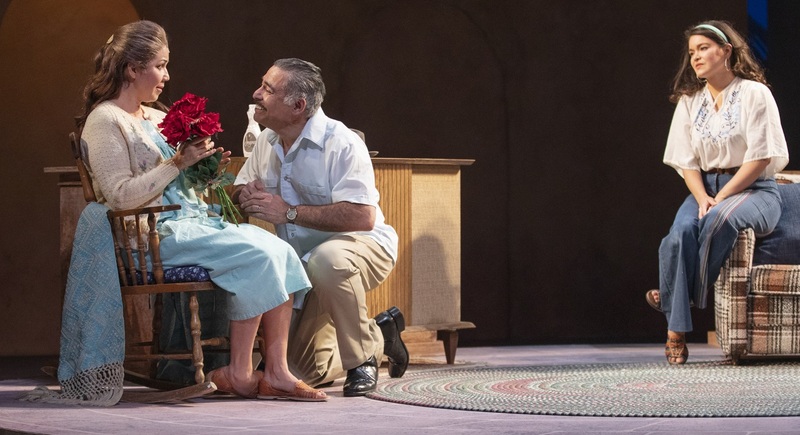 But the play’s thoroughly conventional direction is not altogether a bad thing. The fun of American Mariachi presented with ATC’s expected level of high-production values is the 105-minute journey, as familiar as it all feels, not the outcome. And if the style of music was usually perceived as that trumpet noise played annoyingly loud while you were trying to eat at a Mexican restaurant, American Mariachi should alter attitudes. For a start, search for Maria Muldaur’s Gringo en Mexico on YouTube. It’ll now sound like bliss. If there’s anything you’ll draw from Gonzalez’s play it’s a change of perception. You’ll never hear those Mariachi arrangements in quite the same way again.